The need to travel doesn’t stop simply because it’s dark outside. In fact, you may find that you have to hit the roadways long after the sun has set for any number of reasons, whether it’s to get home from work, to start a night shift, to head to dinner with your family, to pick up the kids from the mall, or for some other purpose. The problem is that driving at night poses considerably greater risks than driving during the day, with the likelihood of a fatal crash increasing in the nighttime. Moreover, night accidents are more likely in the winter because Daylight Savings Time is no longer in effect. 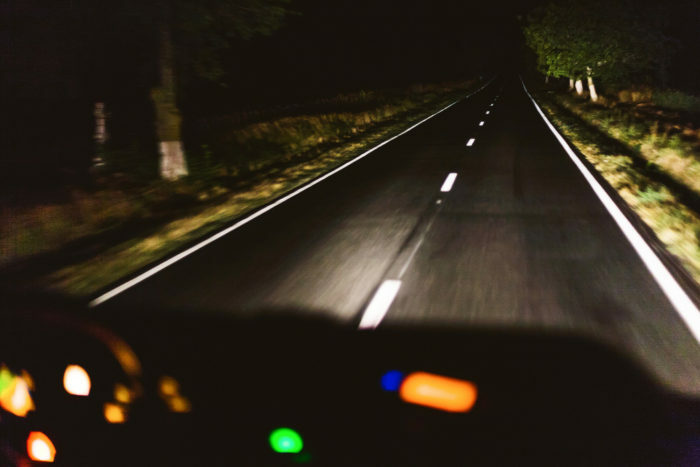 The causes of night driving accidents can include limited vision in the darkness, poor street lighting, heavy traffic during rush hour, drunk drivers on the road, and general fatigue and tiredness caused by working all day. That’s why it is crucial for motorists to exercise extreme caution while traveling on NJ roadways at night. A lot of vehicles come equipped with headlights that automatically turn on at night or dusk. You do not want to expose other motorists, as well as pedestrians, to the risk of a sudden collision because they can’t see your vehicle on the road. Don’t forget to always turn on your headlights if you are using your windshield wipers. That is a law in New Jersey and Pennsylvania. You will need to use your headlights in the darkness, so make sure that they are clean. This will help you to see the road ahead of you and ensure that other motorists can see you on the roadway. Keep in mind that other motorists will also be using their headlights at night. If you look directly at the oncoming lights, you could find yourself struggling to see the road. So try to look away from the other vehicles’ headlights. You don’t want the glare from other vehicles’ headlights to affect your vision. So clean your own vehicle’s windshield and get rid of any streaks before hitting the road at night. Your mirrors can pose a real problem if they have streaks on them. That’s because the mirrors will reflect lights from other cars at night. So make sure that your mirrors are clean before you travel in the darkness. Many cars come equipped with lighted dashboards. However, these lights can be distracting, especially when it’s dark outside. So consider dimming your dashboard prior to going out at night. The key to avoiding a night driving accident is to understand the inherent risks of traveling in the darkness. Don’t travel so fast and even consider slowing down your car when you find your visibility reduced. One of the best preventive measures you can take this winter is to visit an eye doctor and get an eye exam. You could struggle to see at night, so make sure that you have glasses if you need them. If you or someone you know was injured in a motor vehicle accident on a New Jersey road or highway, you should speak with a qualified personal injury lawyer immediately. Richard Stoloff is an experienced personal injury attorney who will help you explore your legal options. Contact Mr. Stoloff now to schedule a free initial consultation.